All natural. If you happen to be in the Hamptons on Eastern LI, NY and you stroll around the charming village of Southampton, you'll see a cozy colonial-era building, framed in flowers, that seems to attract people like bees to a hive. It's Tate's Bake Shop, the fairy tale culmination of a dream that got started with 11-year old Kathleen King began baking cookies to sell at her family's farm stand not far out of town. Today, those amazing cookies have attracted a loyal following from coast to coast, crispy and buttery, rich but not overwhelming, they simply melt in your mouth - and just one is never enough. Try all our flavors and discover what cookie happiness truly is! 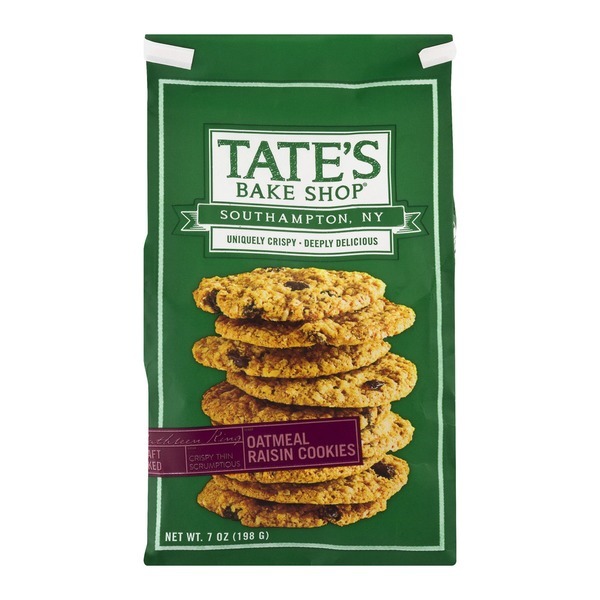 Tate's Bake Shop Cookies have been tested & no GMOs have been detected. Made in the USA. Butter, Unbleached Flour (Wheat Flour, Niacin, Reduced Iron, Thiamine Mononitrate, Riboflavin, Folic Acid, Malted Barley Flour), Oats, Brown Cane Sugar, Cane Sugar, Raisins, Eggs, Milk, Salt, Baking Soda, Vanilla Extract, And Cinnamon.